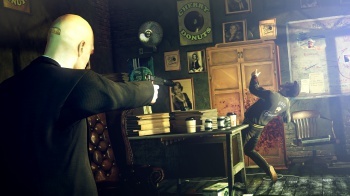 Negative reactions to Hitman Absolution's "Attack of the Saints" trailer caught IO Interactive by surprise. The developers of Hitman Absolution caused quite a stir earlier this year with the game's "Attack of the Saints" trailer, which featured protagonist Agent 47 assassinating a group of lingerie-clad, weapon-wielding nuns. IO Interactive later apologized for the trailer controversy, stating that it wasn't trying to offend people. According to director Tore Blystad, that portion of the game has since been tweaked, with backlash from the trailer causing the developers to change the game. "We learned from the trailer that we really needed to give these characters some context and some backstory," Blystad said at Gamescom today. "We're working within the game - within that level - to build these characters up before you meet them. That way you know what you're getting and you aren't put off by them." He reiterated the developer's surprise about the controversy, adding, "We've been trying to find out, y'know, how could we not see this happening? If we knew it would get such a negative reaction we would have done it in a different way." Blystad doesn't expect any future backlash over Hitman Absolution's content, expecting gamers to be satisfied with the changes the studio has made. "There will have been so long between the trailer coming out and the game being released that people will have forgotten about it." No specific details were given about the changes made to the Saints portion of the game, so it's hard to guess whether or not "some context" will really clear up the issues some viewers had with the trailer. Hitman Absolution is due out in November, so only a few months remain until we find out if gamers really will forget about "Attack of the Saints," as Blystad predicts.